MILLER PLACE, Long Island, N.Y. — A violent collision on Long Island between a small sedan and a motorcycle sent two people to the hospital. The motorcycle operator was in critical condition with multiple traumas over his body. A med-flight helicopter rushed him to a nearby trauma center. The driver of the sedan also sought treatment at a local hospital. The motorcycle accident happened at around 1:30 p.m. according to Long Island 12 News. Suffolk County police accident investigators continue to inquire about the cause of the crash. Suffolk County police, fire, and rescue personnel raced to the scene of the crash reported being on Route 25A in Miller Place. Between 1:30 p.m. and 1:40 p.m., first responders received the emergency call. Upon arrival, they found a 2017 Nissan Sentra on a grassy area and the motorcycle down in the middle of the road. Debris from the motorcycle was thrown around the area. The initial investigation conducted by Suffolk police revealed that the 69-year-old operator of the Nissan Sentra, a woman from Port Jefferson Station, tried to turn left in front of the motorcycle. Police indicated that the motorist was heading easterly on 25A and attempted to turn into the North County Shopping Plaza when the crash occurred. She hit the motorcycle rider who was traveling westerly on 25A. Police later identified the motorcycle rider as a 27-year-old man who lives in Miller Place. Police have announced that anyone with information about the crash contact Suffolk Police. The investigating officers impounded both vehicles so they could perform safety tests. 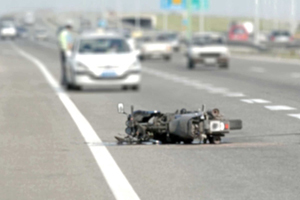 Have you or a member of your family been injured in a motorcycle accident?